One of my very favourite times of the year to visit Paris is in August. I love August because Parisians leave the city for their summer holiday and the entire city gets a little quieter, a little softer, a little bit more accessible and wide open to exploring with the usual buzz at bay. It seems this secret is slowly being shared with more tourists sharing the streets of Paris during this quiet time. There is still a feeling, though that you have Paris all to yourself and it makes for the perfect summer long-weekend destination. If you’re wondering where to start your visit to Paris, this pocket guide will lead you to what to see in Paris in 4 days. Paris may very well be one of the easiest places to get to in Europe, with two major airports (Charles de Gaulle is or Orly) and a few surrounding smaller ones. Compare prices on flights with Skyscanner and use this tool to help plan the fastest route to and from the Paris airports to the city. Paris is also very accessible by train or bus from the rest of Europe. I arrived in Paris very happily wanting a slow-down after a whirlwind month of travel exploring Corsica and Italy. I checked in to Hotel Therese and the big easy began instantly. This five-star, luxury property is perfectly situated in the first arrondissement and within walking distance to some of my very favourite spots to visit. It is tucked away on a quiet street so you have the best of both worlds: quiet time to relax and rest as well as proximity to the electric energy of the city within minutes. “Little luxuries” is a phrase Hotel Therese uses to describe their approach to the intimate feel of their property, the staff, and the attention-to-detail given to each guest from the moment they arrive until they say “Au Revoir.” It is the perfect place to land if you have just a little bit of time in Paris to explore, or if you are craving an intimately quiet refuge in the heart of the city of love. My Mini Charm, 12m2 Classic Room, with fluffy queen-size bed and quintessential Paris view of rue Thérèse was perfection. I opened both windows immediately and let the sounds of the city that I love float in, and the window view was my breakfast spot the first morning I stayed. Among the many special things about Hotel Therese was the afternoon tea every day in the lobby. A variety of teas, coffee and pastries, candies and other delectable are served, with an invitation to linger in the velvety space. I also loved that I could borrow a scooter to take on my city adventures and I even ordered the in-room rowing machine one afternoon because I wanted to try it. A very short distance from Hotel Therese is the beautifully bold and inspiring space of the Grand Palais (soon to undergo a major refurbishment), arrive early morning just before they open and have a coffee nearby then sneak in just as the gates open so that you have the entire space to yourself. A beautiful statue of Molière points you in the right direction (Fountain Molière) and is a reminder of how beloved this comic genius is in Paris – as are many literary greats. Making a bee-line from the Palais, crossing the grand Bonaparte, you can visit the Louvre in just minutes. An early morning walk earns you a courtyard with a rare view of the Louvre all to yourself. From the Louvre in any direction you can continue your walk to the Eiffel Tower, Notre Dame or Arc de Triomphe, enjoying the quiet morning of a sleepy city full of night owls. Return to the Louvre for a nightcap at Café Marly, where you can enjoy a cocktail at one of the terrace tables overlooking the Louvre courtyard until 2am. 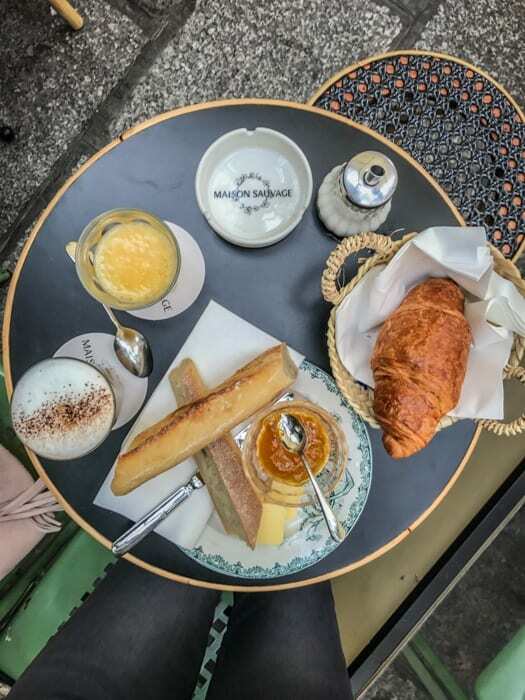 One of my very first priorities each time I visit Paris is a walk directly to Saint Germain des Prés, where I have coffee nearly every morning at Maison Sauvage, a newish café with the perfect French breakfast of juis de oranj, croissant and espresso. Perfectly situated in the heart of the 6th, Rue de Buci has some of my favourite little shops including a vintage shop where I lusted over a Prada maxi this summer, Carton bakery which bakes one of the best croissants in the city, a cute paperie with cards and pens and things, and TASCHEN bookstore which sells the most beautiful books I’ve ever seen. A full day can be spent in the 6th district, one of the best places to people watch and catch your breath after exploring the major landmarks nearby. Worth a special trip is a visit to my very favourite bakery in all of Paris, and yes I know this is saying a lot. I love Poilâne for a handful of reasons, all having to do with love in my heart and in my tummy. I was introduced to this very local bakery by a Parisian and quickly became addicted to the signature shortbread cookies that are bagged and sold fresh every day. It was later that I connected with Apollonia who is the 3rd generation of Poiláne bakers. The heritage of Poilâne now rests on Apollonia’s shoulders and she manages five Paris locations and four locations outside of Paris. My favourite spot is the shop in Saint Germain des Prés. Unique to Paris in July and August are the Paris Plages which are created every summer along the Seine River. Temporary “beach clubs” are created, sand and all, with lively atmospheres and special events all month-long. This tradition began in 2002, and was created for the non-holidaying residents of Paris, so that they could escape the heat for a mini holiday close by. Two of my favourite parts of the city to visit outside of Saint Germain des Prés are Montmartre and Le Marais. I think because I live in San Francisco and I’ve become fond of the distinct neighbourhoods in my home city, with favourites there too, it is easy to slide into this feeling in Paris. I visit Montmartre when I feel like being inspired by art, or if I want to climb to the top of Sacre Coeur for a picnic lunch and a grand view of the city. The vintage shops in the Montmartre district, and famous flea markets make this part of the city a must-see for me. My favourite vintage shop is Chinemachine which is tucked into a small street on the way to Sacre Coeur. I love to have coffee in the art district and watch painters paint. To get in the mood for your visit to this neighbourhood, watch Amélie and look for the landmarks in this classic French movie that made this area of Paris extra famous. You can even stop for lunch at Café des Deux Moulins which really exists, and it still looks exactly like it did in the movie. I love to sit outside at one of the tables on the street and people watch, this is a great place to have a crepe and coffee or a delicious salad. Le Marais, or Jewish district, is a foodie destination for me as well as bakeries and boutique shopping. The Holocaust Museum is in this neighbourhood, and it contains powerfully emotional historical records. Lines and lines of falafel eating people line the streets of the Marais on a typical summer day, and Chez Marianne is the place where I go every time to enjoy authentic Jewish food. The falafel here is bar none but you can’t order it from the table, you have to stand in line with everyone else. I order the sampler plate with four or five choices so that I can try a little bit of everything. There are many bakeries in the Marais, including a Poilâne location, be sure to pop into a few if you like Jewish pastries. There are many beautiful churches and cathedrals in Paris, all worth seeing. St. Gervais-St-Protais Church in the Marais stands on one of the oldest medieval streets in Paris and houses the oldest organ in the city (1601). Take a walk to Île de la Cité for dinner one night and find your way to Notre Dame Cathedral afterwards. This beauty is magnificent during the day, but absolutely incredible by night. Have a coffee and people watch in the courtyard by Le Madeleine. Sit on the bench opposite the Saint Sulpice Church and look at the fountain and façade in front of you which looks like a painting. Take the metro to Père Lachaise Cemetery on a day that you have time to wander through the biggest cemetery I have ever visited, it is 110 acres. If you happen to be in Paris on a rainy afternoon, put your boots on, grab an umbrella and visit this spot for a moody and dramatic Parisian adventure looking for famous headstones like Oscar Wilde, Jim Morrison and Gertrude Stein. Speaking of writers, this is probably my most favourite thing about Paris: how beloved writers and writing is. I visit Shakespeare & Company every time I’m in Paris, it is the sister bookstore to City Lights in San Francisco. I love the adjoining café which always has a healthy, daily vegetarian special, but what I love about Shakespeare & Company is the shop’s cozy interior with painted steps and inviting alcoves, and a back room upstairs where you are welcome to stay as long as you want to read, write and daydream. Of course, no trip to Paris is complete without visiting some of the famous museums. When planning what to see in Paris in 4 days, prioritise one or two museum visits. The first Sunday of every month is free admission day, so if your long-weekend visit falls at the beginning of the month, decide whether or not you want to go when everyone else is going and get to the doors well before opening. I have always loved visiting the Musée d’ Orsay, and the Picasso and Rodin museums. If you are interested in catacombs, the underground catacombes museum in Paris is quite something – be prepared to feel committed to staying underground for about 30 minutes, it took me a few deep breaths to adjust to the idea but the experience was interesting and unique. I have so many favourite works of art in Paris, two that I love are the Chagall painting on the ceiling in the Paris Opera and the painted wall of poetry on rue Férou which has Rimbaud’s poem Le Bateau Ivre painted on it. Paris is a city oozing with art, you can find it everywhere you look. There are so many delicious places to eat in Paris that I couldn’t possibly name them all and it’s impossible to try them all, but I do have a handful of favourites that I haven’t mentioned already that are definitely worth a visit. If you are looking for a traditional creperie, I highly recommend Broceliande located in the 9th arrondissement, be sure to order a cider or two to go with your savoury crepe. For a quintessential and highly coveted French dining experience go early to avoid a long line for a table at Le Comptoir or pop next door for their version of Le Comptoir on-the-go. Another splurge, and a treat I enjoyed my very first time to Paris over a decade ago is Joël Robuchon’s L’Atelier located in Hôtel Pont Royal. The chef’s creations are the most exquisite, and most delicious, works of art I have ever seen or tasted – it is a must-see when you visit Paris. I never miss a trip to a La Tarte Tropézienne shop when I’m in Paris, these tarts unique to France and created in Saint Tropez in 1955, are my very favourite. The light, airy, and fluffy pastry sandwiches an equally light custard filling, and the sandwich is sprinkled with coarse sugar on top. It’s impossible to have just one. I love Café Vesuvio for pizza, and pasta that is nearly like what I’ve had in Italy, and equally delicious. Vesuvio is close to Café Mabillon where I like to enjoy an aperitif before or after dinner. Order a Campari and soda, otherwise known as a “Spritz,” and it will come with popcorn and pretzels, along with the greatest people watching. It isn’t hard to stay active in Paris, it’s a walking city and this pastime is shared by many. If you feel like a two-wheeled adventure is calling you, Fat Tire Tours is a great bicycle touring company in Paris where you can take a day trip with them that begins at 10:30am and includes lunch in the Tuileries Gardens and a ride by many landmarks. The guides are happy to stop and take photos along the way; this is a great way to explore many parts of the city in one day. I attended a beautiful Vinyasa yoga class at Rasa Yoga Rive Gauche, which is where my teacher Rusty Wells teaches when he is visiting Paris. I also attended a lovely Jivamukti Vinyasa class at Yoga Village that I loved. Of course, visiting any one of the beautiful parks in Paris is a must too. The French have perfected the art of fashionable lounging, and dare I say their own form of lagom. It is not unusual to see people of all ages and at all times of the day and week, with their shoes off and feet up lounging on the hundreds of green metal chairs found in the parks all over the city. Jardin des Tuileries and Jardin du Luxembourg are well-known, beautifully maintained and easily accessible. To mix with more locals, head for Parc des Buttes-Chaumont or Le Canal Saint-Martin for a picnic on Saturday or Sunday afternoon. The Fit Traveller was a guest of Hotel Therese Paris during our stay. As always, the opinions, words and images are authentically our own.